As much as I love to cook, I also love to bake. I am equal parts thrilled and terrified by how exact a science baking is, but I do enjoy the challenge of the chemistry, tradition and history. It has been thrilling to overcome some of that wariness and experiment with ingredients and common sense to come up with baking recipes. There is certainly a time and place for showy, richly iced and perfectly decorated celebration cakes. Personally I love to make them for birthdays and holidays; I even co-baked my own wedding cake, however, there is also a time and place for very simple, un-fussy baked goods, just a little something sweet to finish off a meal or to have with lunch or tea. This nectarine cake is just that kind of baked good. 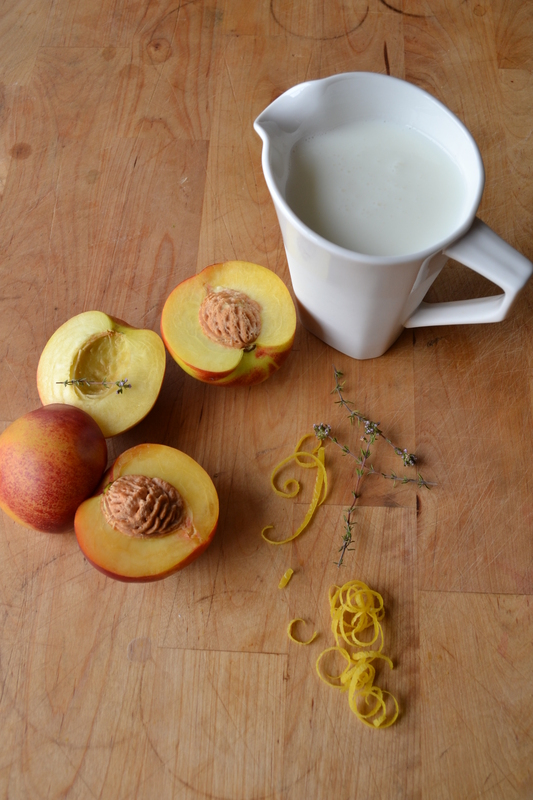 Somehow I had never learned/realized that a nectarine is just a bald peach until very recently. I always put nectarines in a more sophisticated category, as if their smooth, deeply coloured skin and the word “nectar” in their name elevated them beyond the fuzzy, less showy peach. Funny how those associations can happen. In the end, it’s just a variety of peach, no better or worse, no more glamourous at all. Nectarines, however, do afford you the reduced effort of just a quick rinse, instead of a thorough rub to remove their fine fur, and I still think, a punchier flavour. Butter and flour a 8″x8″ baking dish. Set aside. Cut the nectarines in half, twisting to release the pit. With the cut side down, slice each of the four halves into 8-10 slices. Set aside. In a mixing bowl, cream together the butter and sugar until well incorporated. Add the 2 eggs and beat until pale and smooth, about 2 minutes. Add the vanilla, lemon zest and the almond extract. In a separate bowl, combine the flour, baking powder, baking soda, and salt. Add the dry ingredients to the egg and butter mixture in 3 parts, alternating with the buttermilk (dry, wet, dry, wet, dry) mixing as little as possible. The batter will puff almost immediately as the acidic buttermilk reacts with the leavening. Work quickly to transfer the batter into the prepared dish. Insert the nectarine slices into the batter so some of the fruit remains exposed. Sprinkle with thyme leaves and the remaining teaspoon of sugar. Bake for 50-55 minutes until, puffed, golden and a toothpick inserted into the center comes out clean. Guest Post: this time I’m the guest!